Iran’s supreme leader lashes out at the United States, even after his country seized a ship in the Persian Gulf. Iran’s supreme leader, Ayatollah Ali Khamenei, on Saturday accused the United States of only pursuing its own interests and of making the Middle East “insecure”, The Associated Press (AP) reported. The comments come amid international fears about ships in the Persian Gulf, which began after Iranian forces seized a ship and fired on another in recent days. Iranian patrol boats two weeks ago forced a Marshall Islands-flagged ship, the Maersk Tigris, to Iran's Larak Island after firing warning shots. The Islamic Republic later threatened to sell the ship unless a massive fine is paid by the ship's owners. Iran’s provocations prompted Washington to announce that naval forces would accompany American-flagged commercial ships passing through the Strait of Hormuz. On Thursday, an Iranian naval patrol fired on a Singapore-flagged commercial tanker in the Persian Gulf, which Iranian press linked to a dispute over an accident that damaged both the ship and an Iranian oil platform on March 22. Khamenei’s comments follow a summit in Camp David this week, in which President Barack Obama pledged Washington’s “ironclad commitment” to the Sunni governments of the Persian Gulf and even spoke of authorizing U.S. military force if their security is endangered by Shiite Iran or anyone. Obama’s comments sought to soothe nerves in the region over Iran, which the West also accuses of arming the Houthi rebels in Yemen, who have swept through much of the country and pushed its president into exile. Gulf states have also been repeatedly expressing their concern about the terms of a potential nuclear deal and warning that a final agreement could allow Iran to keep the technologies needed to produce nuclear weapons. 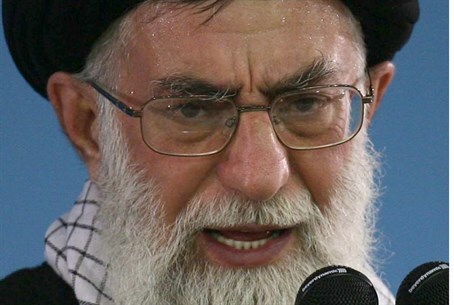 This is not the first time that Khamenei has lashed out at the United States. Several months ago he encouraged the “Death to America” chants that are heard during public rallies in Iran.